Do you scroll through your Instagram feed and see beautiful homemade meals prepared by your friends? While they are sharing healthy, beautiful meals you are struggling to motivate yourself to make dinner. We’ve all been there. We barely make it out the door with the kids, work gets crazy, and then come home and the last thing we want to do is make dinner. 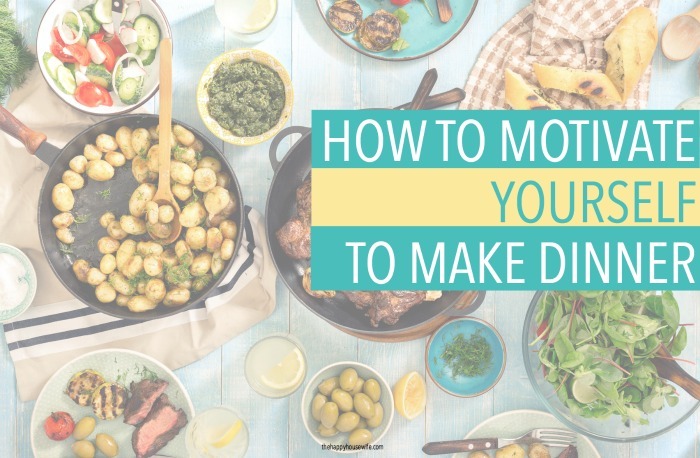 When we’re sick or not feeling up to it, it can be extremely challenging to get dinner on the table. Takeout or heading to a restaurant is convenient, but is expensive over time. If you’re trying to cut back on eating out, or just need some motivation, here’s how to motivate yourself to make dinner. If your meals take hours to prepare, you’ll never make them. It’s more important make dinner, not make the world’s best dinner. Sandwiches, fruit, and salad is dinner, and is probably cheaper and healthier than anything you’ll order at a restaurant. Keep your menu plans simple to combat the urge to eat out. When my kids were younger I asked them what their five favorite dinners were. I combined their answers and added a few extra ideas to come up with 3o days of meals. 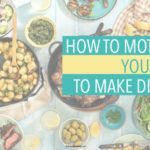 I used this list for several years, plugging in dinners from my list to create my weekly menu plan. Coming up with a fresh new dinner each night is exhausting. Save yourself some trouble by making a menu plan. When you have a menu plan you no longer have to think about what’s for dinner. The menu plan tells you what to make for dinner! Do you need meat out of the freezer, you can plan for it. If you need to put everything into the crock pot in the morning, you know how to do it. When you know what you’re making, it’s takes less brain power to make it. Giving yourself the night off doesn’t necessarily mean eating out. It could mean peanut butter sandwiches, frozen pizza, or leftovers. If you can treat yourself to a night out every once in awhile, do it! But if you can’t, there are other ways to give yourself the night off. This will keep you from cooking burn out, and still ensure you get dinner on the table. If you plan for a night out, you can find restaurants were kids eat free or maybe they have 1/2 price appetizers during happy hour. If you plan your meals out, you can capitalize on coupons and discounts and save. After one of my children was born I realized I needed some quick go-to meals that took less than 30 minutes to prepare from start to finish. I came up with my fast five meals. These were meals my family enjoyed and I could have on the table quickly. To make your list of fast five meals look for recipes with short prep and cook times. 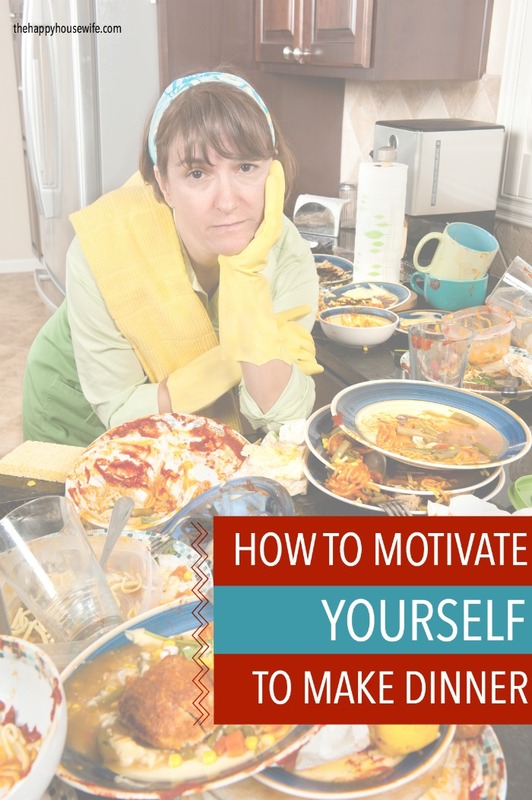 It’s easy to motivate yourself to make dinner if you know it will only take 15 to 20 minutes. If you don’t mind waiting for food to cook, look for recipes with short prep times so you can have dinner in the oven in just a few minutes. I know this doesn’t work for everyone, but I have more energy in the morning than I do after 5pm. This works best for crock pot meals (throw everything in before you leave for work, school, or start your day) but it can be done with most meals. While my kids eat breakfast or get ready it is simple to chop vegetables for a salad, brown meat for tacos, or other dinner prep that can be done ahead of time. For years I avoided freezer cooking like the plague! I tried it once and destroyed my kitchen, spent nine hours cooking, and never wanted to make dinner again. To make matters worse, my family didn’t love a lot of the meals I made. However a few years ago I decided to give it another try, except this time I decided to freezer cook with a friend. This was a totally different experience and I highly recommend it! We had meals for two months and it made dinner time so easy! The one thing that motivates me to make dinner more than anything else is when I do the math. It costs approximately $35 for my family to eat dinner at a fast food restaurant (a cheap one like McDonalds- not Panera, FiveGuys, etc). It costs about $10 to feed my family dinner and we typically have leftovers for at least one lunch. For each meal I make at home I save $25. If we swap out one fast food restaurant meal for a dinner at home each week for a year that’s a savings of $1,300. Over 18 years that’s $23,400. I don’t know about you but I’d rather eat chicken quesadillas and a salad a few times a month at home and have $23,000 to show for it after my kids grow up!